"While you are at Hogwarts, your triumphs will earn your House points, while any rule-breaking will lose House points. At the end of the year, the House with the most points is awarded the House Cup, a great honor. I hope each of you will be a credit to whichever House becomes yours." Points are given or taken away to reward or punish the behavior of students. Points are accumulated over the course of the school year, at the end of which a House Cup is awarded to the house with the most. Giant hourglasses set in niches along one wall in a corner of the entrance hall record the points for all to see; Gryffindor’s is filled with rubies, Ravenclaw’s with sapphires, Hufflepuff’s with diamonds, and Slytherin’s with emeralds. As a teacher or other authorized party speaks the words awarding or deducting points, the appropriate hourglass or hourglasses are automatically updated (PS15, OP28, OP38). Prefects are allowed to take points for infractions, but not from fellow Prefects (OP28). 'Afraid I'm going to have to dock a few points from Gryffindor and Hufflepuff,' he drawled. 'It's only teachers who can dock points from houses, Malfoy,' said Ernie at once. 'Yeah, we're prefects, too, remember?' snarled Ron. 'You can't take points from fellow prefects, Malfoy,' said Ernie at once. In the films, the house point hourglasses are on the wall behind the teachers' table in the Great Hall, while in canon they are located in the Entrance Hall. Before J.K. Rowling's Twitter, it was previously unknown what is in the Hufflepuff hourglass. 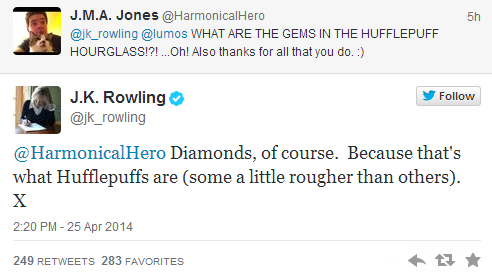 J.K. Rowling replied to a fan tweet, saying it is filled with diamonds.